Murtaja Baseer was one of the artists who diverged from the traditional way of picture making in the 1960s. By banding with other artists of his generation who were exposed to Euro-American modernism, he too ventured into a newer ground and started doing abstraction. Yet he is not merely known as an abstractionist in this region. Being an artist who is willing to transgress his past experiences, he has tackled different idioms at different times. There were phases that mark his journey from one way of picture making to another. His oeuvre is proof that he has a tendency to express himself in varied languages of art. But underneath all the variations there lurks an artist who is unrelenting in his effort to seek beauty in every day reality. With his tendency to focus on the beauty of things, he can be bracketed in the category of the naturalist, with his willingness to find a unity in forms, he can be called a formalist, but no matter how he has been able to express himself, he is, at the core, an incorrigible realist. On his 73rd birthday of his life he is the subject of a major retrospective. 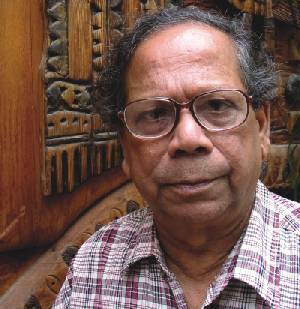 SWM looks into the life and art of this septuagenarian on the eve of his show that started on August 17, at the Bengal Gallery of Fine Arts.